From virtual replicas of physical buildings and “computer vision” software, to full robotic body suits and mini onsite factories, in 2019 construction is set to scale new heights of technological innovation and experimentation. Stephen Cousins reports. The idea that robots could start to replace human workers on building sites is no longer a question of if but when. The bricklaying robot Hadrian X, by Australian firm Fastbrick Robotics, proved last year that it could build the brick shell of a 180 sq m, three-bedroom house in under three days, and in line with local building regulations. Meanwhile, Pennsylvania, US-based Advanced Construction Robotics announced its rebar-tying robot, TyBot, which is able to match the speed of a team of about six to eight site workers with only one worker required to supervise. Looking like something straight out of the sci-fi film Aliens, the Guardian XO Max (pictured top), launched by Sarcos last year, is a robotic full-body exoskeleton that enables the wearer to lift 90kg for extended periods. 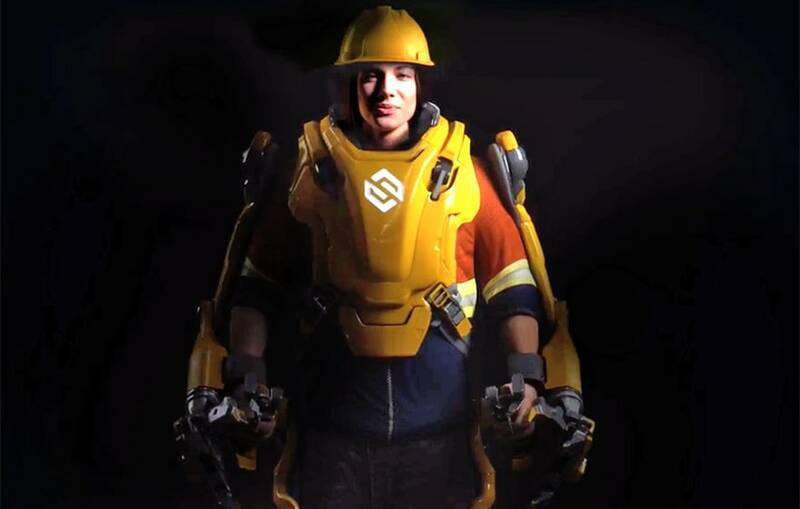 And the first UK construction trials of the upper body exoskeleton suit, Eksovest, by contractor Willmott Dixon, provided evidence of the industry’s willingness to at least partially-automate certain trades. Digital twins are virtual replicas of physical assets that augment BIM with live data from connected sensors embedded in the built environment. Already used by the likes of the City of Singapore and Crossrail, and commonplace in automotive design, they enable designers and city planners to measure the real-time performance of built assets, test-bed new concepts and services, and research new technologies to solve emerging challenges, all well in advance of investment. UK interest in the technology ramped up in 2018, as the government-backed Digital Framework Task Group revealed plans to create a national digital twin of UK infrastructure, effectively an ecosystem of digital twins connected by securely shared data. In support of the initiative it launched the Gemini Principles project in December to bring together government, academia and industry to develop foundational definitions and values to guide the project. Also on board is software house Bentley Systems, which announced a raft of Digital twin-based developments last year. The firm acquired Stockholm-based Agency9, which has provided city-scale digital twin cloud services to many of Sweden’s larger municipalities, and announced a partnership with Atos to create and curate digital twins. Meanwhile, Siemens expanded its two-year partnership with Bentley to create full digital twins for building and engineering projects on its enterprise-wide collaboration platform Teamcenter. The practice of using laser scanners to capture as-built structure on site to identify any deviations from the original design in BIM is a nascent area. This year will see contractors trial systems developed to automate this process using robotics, computer vision and machine learning algorithms. Kier plans to expand its tests of a four-wheeled autonomous robot developed by Barcelona-based start-up Scaled Robotics, which trundles around the building site every night capturing 3D scan data of ongoing construction work. Sophisticated cloud-based software compares this survey information against the original BIM using computer vision tech to automatically highlight any anomalies or missing elements, outputting the results in a daily report. A similar AI-powered issue detection system based on 360-degree camera imagery has been deployed by Mace, Canary Wharf Contractors and Kier. Site scanners installed in every room across all floors of projects captured images of progress, with week-on-week changes tracked using software with computer vision to identify anomalies and measure progress. This year will see the first live deployments of “factories of the fly”, mini onsite manufacturing units where robots custom-make building components at the push of a button. Danish tech firm Odico is finalising the development of a product that would be shipped to projects inside a standard shipping container and cost between £160,000 and £320,000, depending on the complexity of the hardware and the specific application. The system would use locally sourced materials to custom-fabricate products, including formwork, insulation, reinforcement or tiles, saving on labour costs and avoiding the delays associated with sourcing and shipping custom-made products from specialists. Following in its footsteps is Autodesk, which has developed what it describes as “a large-scale additive manufacturing ‘toolbox’” that would also be trucked to site in a shipping container. The trial concept combines two Panasonic TS-950 robots, from Dutch robotic welding group Valk Welding, which are able to 3D print bespoke metal components. Dutch construction group Dura Vermeer was asked to come up with ideas for items for the system to produce: it suggested a customised “steel spider” connector for fixing a glass curtain wall to the steel structure of a building. The traditionally siloed worlds of geographic information science (GIS) and BIM are starting to come together, raising the prospect more holistic design environments for construction and infrastructure projects, or even entire districts and cities. Adding layers of geospatial context into BIM makes it possible to place buildings within the wider context of other structures, utilities and the environment, including topography, water resources, coastal barriers, cloud coverage, models of air quality, aircraft noise, solar energy potential and demographic data. This enhancement can improve design decision making, influencing factors such as a building’s location, orientation and even the selection of construction materials. The recent partnership between BIM powerhouse Autodesk and GIS giant Esri, which controls around 43% of the GIS market, will improve interoperability between the two systems to benefit projects. Users of Autodesk’s BIM platform InfraWorks can now import data on features like roads, pipelines, and electrical transformers from ArcGIS files and in a forthcoming update ArcGIS will be able to connect with Revit and BIM 360 programs and read native files. A further boost has come in the form of the award-winning Visualise consortium, comprising Skanska UK, The Carto Group, BRE, 3D Repo and Unit9, set up to bring together data from discrete asset systems and combine it with BIM and GIS to enable the more efficient management and construction of infrastructure assets. Cloud computing has been identified as a key foundation for BIM Level 3 (or iBIM) that will enable real-time multi-access collaboration within a browser-based BIM environment, eradicating the need for the processing power of a PC. Project teams are increasingly moving into cloud-based environments that can be accessed by any stakeholder from anywhere using a smartphone, tablet or other mobile device. The fact all users are connected means updates to plans, RFIs and other key documents are automatically synchronised in real-time.